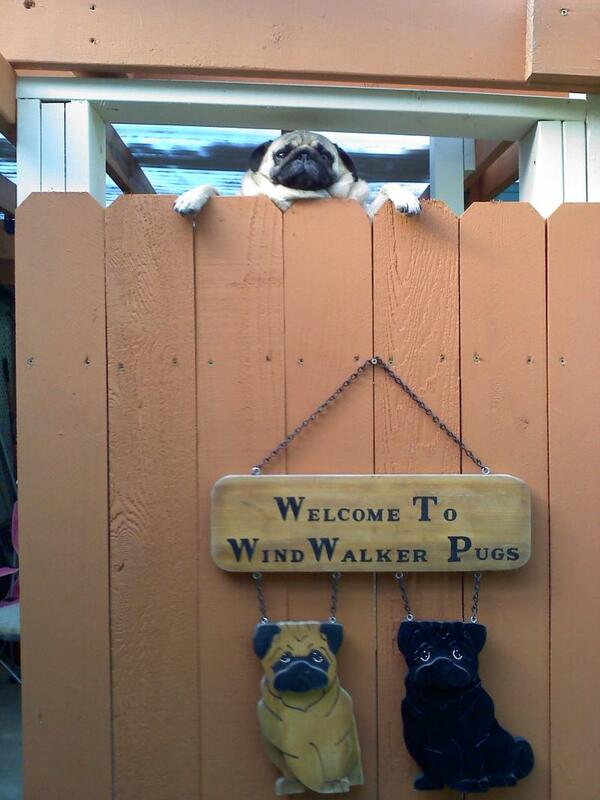 Established in 1994, WindWalker Pugs® was founded on the belief with hard work, dedication, and commitment, we could breed Pugs to the AKC Standard. As an American Kennel Club (AKC) Breeder of Merit, we are focused on breeding quality AKC registered Pugs, to the AKC Pug Standard. We are members of the Pug Dog Club of America (PDCA), the Gig Harbor Kennel Club (All Breed), and we are also members of the Canadian Kennel Club (CKC). We show our Pugs in AKC, and occasionally in CKC, Conformation events, and breed only those Pugs we feel will contribute to the breed. We also strive to learn more about the Pug breed by attending seminars and presentations to enhance our knowledge of their daily care, and health concerns. Animal Research Lab at UC Davis. More information on the test and how to get one for your Pug, is available on their web site, as well as on our Links page. As we received the results for our Pugs, a digital copy of each report will be linked to their individual page. Look for these links near the Pug's pedigree link. We will now only do a breeding a litter if at least one Pug has been tested clear for the susceptibility gene, thus preventing any of our Pugs from producing a pup with two copies of the gene. This test is a fantastic tool, only made possible by the research paid for by PDCA's Pug Health Fund and the AKC's Canine Health Foundation. As part of our commitment, we, as members, will continue to support the Pug Dog Club of America's Health Fund, as well as Pug Rescue organizations throughout the US. We have personally rescued, as well as assisted in the rescue of Pugs and other mixed breed dogs since before we bred our first litter. As exhibitors, we have been successful in the show ring. Top 20 Specials, and breeding and/or owning 38 AKC and/or CKC Champions to date. More importantly, we have received more from these wonderful little creatures in our lives than words can ever say. We try to give back, by participating in our local AKC all-breed club and promoting responisble dog ownership and sports in our community. Pugs are friendly, loving, loyal, faithful, fickle, funny, quirky, playful and stoic. They give us far more than a few dog show ribbons. We occasionally have Available Pugs. We sell those pups that have not met our expectations for showing and/or breeding to loving homes. We sell them so they may enjoy life in a household where they will receive more individual attention than we can give to each one if they all were to stay here as part of our gang. All pet Pugs over six months sold by us are spayed/neutered prior to leaving. Those younger than six months are sold on a spay/neuter contract. All our Pugs have also been microchipped, and have a contract, outlining the terms and conditions for their required care, and a provision that the dog be returned to us if for any reason the buyer(s) cannot keep it. We do this, not to control the buyers after the sale, but to provide a safety net for the dogs we are responsible for and to help ensure they live happy, healthy lives. We believe this is our responsibility, as breeders, to each Pug we bring into the world. This also means we are available to help you, should the need arise, long after you buy the Pug. We only breed our Pugs when we want another show puppy or two, and we only sell show dogs (intact Pugs) to those established show homes that we are personally acquainted with, or come highly recommended to us by a mutual friend. We want each of our Pugs to live out their lives as valued household members. We are not as interested in how many are finished champions, as we are in knowing they are loved and cherished family members. As part of our commitment to provide solutions to both pet owners and breeders, we are proud to be Life's Abundance pet products distributors. We feel it is important to feed our dogs a high quality food, and we are especially happy with both the wholesomeness and freshness of their kibble. Made in their own manufactuing facility, it is guaranteed to never be older than six weeks when delivered to your door. Checkout our other products on our StarWalker page. We always welcome, comments, questions and/or suggestions!